Reed and J.W. talk about first time builds and what we’ve learned over time building AR’s. Welcome to Episode #059 of the AR15 Podcast. I’m your host Reed Snyder and with me today is our auditioning sacrificial host, J.W. Ramp. This is the podcast about your favorite black rifle! This show is for you; whether you're building your first AR or you’ve been building ARs for years. There is something we can all do to take our black rifle to the next level. For times in the field when you just can’t reach your Otis cleaning system and need a quick and effective clean – reach for the Ripcord®. This convenient tool cleans from Breech-to-Muzzle® in one quick and easy pass. The molded rubberized core and Nomex® fibers together create a more effective way to trap and remove fouling. PS, please put me in for your give away. While shooting from a lead sled or a set of bags is great for zeroing your carbine, the real-world application for shooting from a concrete table are next to zero. Next time you’re at the range, spend more time working from different stances - standing, kneeling, sitting, prone. If your range has them, use roof support columns as concealment and as a surface to steady your rifle against. You’d be surprised how easy it is to make long shots from a supported standing position. If you’ve got property of your own or the range to yourself, make sure to practice shooting on the move. Andrew S: Reed, I really enjoyed episode #55 discussing optics with your fellow Marines. I agree with you completely in regards to the iron sights, and found it funny how the two holdouts both argued against needing irons, but both have them and advocated them towards the end of the show. I do not currently have any on my rifle. I just can't get myself to spend the money on them. Please enter me in any contests you may be having. I could really use an Otis Bone Tool or Ripcord. IcarusX: Reed thanks for the great show on optics. I want to thank Jeremy of thinking of those of us who cannot afford a >$400 optic and TRYING to make it relevant to those of us who are not part of the gun cultural elite or have such snobbery. Granted I would love an EOtech or Trijicon, but the reality is the AR(Another Receipt) platform does not lend for getting everything you want all at once. Jeremy, thanks for keeping it real. John: Hey guys, really enjoy the show! Getting ready to start my first AR build and your information has been most helpful. I was writing in response to your optics a different perspective episode. You asked the guys about a optic at a lower price for those who can't afford to break the bank what they would go with. Not sure they were quite getting what you were asking. Check out the Lucid HD7 Gen 3. Maybe do a little review. It’s a very nice optic for around 300 dollars I believe. Please enter me in any contest you have at the moment, Thanks. Welcome to Episode #054 of the AR15 Podcast. I’m your host Reed Snyder and with us is my special guest Sergeant Louis, a Marine Corps combat marksmanship coach. This is the podcast about your favorite black rifle! This show is for you; whether you're building your first AR or you’ve been building ARs for years. There is something we can all do to take our black rifle to the next level. Winner: Dan M. Hi Reed and Tony, Great job on the podcast! You have helped me through 2 builds now -- one is a standard 16 inch "maneuverable" frankenrifle and the other a 20 inch heavy barrel for longer range plinking. Please enter me in the Otis ripcord giveaway. I enjoyed your scope episode, as it explained many differences among scopes. However, there's this nagging question in my mind. Is it implicitly stated that if you are using a scope for long range shooting or sighting in, then you are also trying keep things steady? 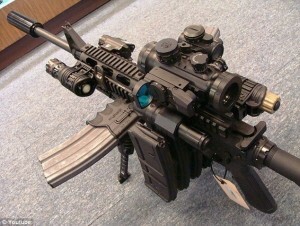 I don't even try to sight in without a table, chair, and some bags or something to support the rifle. Now once things are sighted in sufficiently, then I can try to see how good I am with hand holding or different stances. They are there for you anytime you make a mistake, like when Jake shoots a spring across the room into his shag carpet. 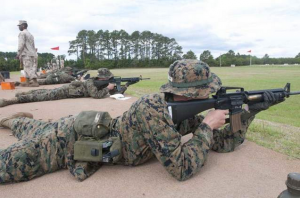 Tip of the Week: Proper breath control is an often overlooked component of the fundamentals of marksmanship. Being something we do so very naturally, it is important to remember that attention must be paid to the natural rhythms of our breathing when on the rifle and then finding that place where we reach our natural respiratory pause. At that natural pause, one must synchronize that pause with a slow and steady rearward application of the trigger. Holding your breath will lead to tremors as a result of oxygen depletion in the muscles. This causes muscle tension which in itself is undermining the principle of muscular relaxation and bone support. Focus on the natural rhythms of your breathing and find your respiratory pause. Grant C: Guys, You're killing me!! Yawl increased the size of some of your podcast so I can no longer burn them to CD to listen to them in my truck back and forth to work. I’m not much of an ITunes guy so I roll old school, can you hook it and post as a part A & B if it goes over 70 minutes? That would be awesome!!! I love the information I get from your show as I always get a gem or two every time I listen. I am making my wish list for my 300 blackout build and am wondering if there are any pitfalls or optimal configuration I should look out for or consider. IE. gas system lengths, buffer/spring weight, twist rates. I see you have a show on reloading the 223 (I still have to listen to it from my computer, to big to burn), how about one on reloading 300 AAC Blackout!!! It seems to be the latest and greatest round, a little expensive and hard to find though. I have read where you can make your own 300 AAC out of 223 brass and 30 cal bullets. Any recommendations, tricks or tips? Greg P: Excellent Podcasts! I was listening to episode 14 for a second time. This episode talked about what to buy and where to buy AR parts. AR parts are built to a pretty tight specification. If one buys Mil Spec parts and installs them correctly there is a pretty good chance that everything will work Right? I’ve just completed my first build. I was looking for assurance of parts compatibility with the specification. With this in mind, I selected only Mil Spec parts for my build. I’ve installed everything correctly. I've function checked the rifle and it cycles rounds nicely (no slam fires). I’ve cleaned and lubed all the required items. So the build is done. I may be overly wary on this point but, what should I do after I've completed my build? I mean, can I now head to the range with my freshly built, cleaned, and lubed AR and start sending rounds down range? Maybe I missed the discussion on the post build process, if there is one. How do I know if my build is safe to fire? The 77 SMK bullets you mentioned you shoot I imagine you shoot at the range, but they are FMJ; yes an open point, but still a FMJ for the most part. Not all brass is created equal, some are harder, some are softer, can case capacity changes. For most reloaders any brass will do with the exception of Federal; Federal is too soft. My work used to use Federal and we for the most part, fire it forget, sweep it up, throw it in the bucket and off it goes to wherever they sell it for recycling. I was running short on brass so I took some of our Federal brass to reload for short range (200 and 300 yards). I was having problems with primers blowing and the extractor ripped over the rim on a couple. Federal is in the only brass I’ve had problems with. I am a purpose type reloader focusing on accuracy and I customize the load to my rifles. I use Winchester or Black Hills Brass for short range and Lapua for 600 yards. I have several pieces of brass I’m on the 5th and 6th reload and the brass shows no sign of wear or donut development. Reloading can be an endless topic. I would like to add two other things I do for reloading. - Deburr the flash hole. When brass is manufactured it is drawn and punched. This means the primer pocket is domed and the depth is not uniformed. Also since the flash hole is punched excess metal comes up and creates a flower petal like effect inside the case. By uniforming the primer pocket you will insure proper seating depth for the primer, which will decrease the change of a slam fire and will make seating the primer easier. By deburring the flash hole (and you only need to do this operation once for the life of the brass) you insure a uniform flash to ignite the powder. What will happen if you don’t have a uniform ignition, is you don’t get a uniform burn and you may get a bullet tip during the bullet jump. Now you will only see this effect at long ranges, more than 600 yards. Caution this operation removes a lot of brass from the case, make sure it doesn’t get in your eyes! I would also add safety to reloading: wear safety glasses, gloves and a heavy canvas work bid. Metal flies, and primers do ignite on occasion (the primer ignition hasn’t happened to me yet, but it has to a couple of friends). If you want to know more than you would ever want to about reloading for completion I highly recommend Glen Zediker’s book “Handloading for Competition” Glen also has other great book on the AR platform for competition. Reed and Steve talk about AR-15 prepping, magazines and hit on the great 555/223 debate. Welcome to episode #24 of the AR15 Podcast. I’m Reed Snyder with my special Co-host Steve, from Gun Guy Radio. This is THEE podcast about your favorite black rifle! This show is for you; whether you're building your first AR or you’ve been building ARs for years. There’s something we can all do to take our black rifle to the next level. The Network’s first theme week. Prepping for the Apocalypse. John: I recently discovered your podcast and I think it's excellent. I was wondering if you guys have ever had the topic on your show about the controversial topic of firing 5.56 and .223? I understand that there is the same type of argument with 7.62 NATO and .308. I'm helping a friend with a build and this has become a big issue to him! It’s a very confusing subject and if you guys spoke of it I'm sure it would help many people understand what the real answer is. Eric: AR-15 (First Build): Phase 5 Muzzle Brake,16" Mossberg 5.56 +1/7 Barrel, Areo Precision Upper Receiver, Advanced Tactical Solutions NiB BCG, BCM Gunfighter Mod4 Charging Handle, Red Jacket Lower Receiver, PSA LPK, Magpul CTR Buttstock, MOE Pistol Grip, Magpul AFG2, Magpul XTM Enhanced Rail Covers, Troy M4 Folding Battle Sights. Glock 17: Polished Slide and Barrel and Pins, Extended Takedown Lever, Extended Slide Release, Maritime Spring Cups, TruGlo TFO Night Sights! I looked into north eastern arms and it looks like they don't just import to NZ, but what they import looks to be of much higher quality than the Bushmaster guns I had previously seen. They also don\'t look neutered excepting the lack of a collapsing stock and flashhider of course. But check out this little number. Ronnie from Cincinnati: I really agree with the assessment that not enough attention has been paid to ammunition. I have listen to, read and watched a lot of NRA show coverage and little attention was focused there. Maybe you guys could get Federal, CCI, Winchester, etc. on the show to talk about the current state, future and innovation in that part of the industry. The regular shortages are what temper my enthusiasm for my guns. for new shooters, I feel really bad. The other issue that makes sense to discuss has to do with your comments regarding innovation. Though I am fairly new to the AR field, I have learned that mil-spec is what everybody focuses on. Is that good? I think that is great, maybe for a combat rifle but I believe it could lead to a dumbing down of weapons, accessory and ammo innovation. With the traditional gun crowd, what percent would you expect would want the federal government to take the lead on anything? I understand that our military has to be the best but so is our Treasury Dept.-tons of smart people, and we have a great education system here in the states, but what of the Dept. of Education Also, the military sticks with the same stuff for inordinate periods of time due to the rigors, politics and money associated with the procurement system. Please consider having a Bravo Company or Colt person on with a non-milspec company like, I don't know Rock River to discuss. You mention that Adcor is innovative, bring them on to talk about it. Anyway, I listen to all your episodes. Keep up the good work. I wear my Advanced Armaments tshirt regularly, thanks. I look forward to meeting you next year in Indianapolis for my first NRA show. I already booked a room at the Hyatt. Last question, did you see many African Americans enjoying the show? I am one and was just curious. It is no big deal because we are like everybody else, we are good guys and gals with guns too. In fact, I really like Mr Colion Noir's stuff on You tube.